Why do women find work-life balance so hard? Why is “having it all” such an elusive quest? Why haven’t women yet reached equality in the leadership ranks? Authors Jodi Ecker Detjen, Michelle A. 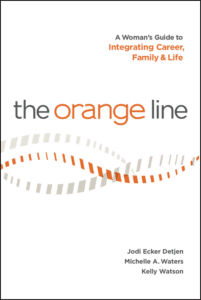 Waters, and Kelly Watson probe these questions and more in their highly anticipated new book: The Orange Line™ – A Women’s Guide to Integrating Career, Family and Life. Through interviews with 118 college-educated women, they document real-world career stories and daily life anecdotes about women’s experiences in the work-life struggle.In their research they uncovered how women trap themselves with outdated but pervasive ideals and rigid behavioral rules that define the “ideal woman.” The authors named this limiting belief system the Feminine Filter™. Not surprisingly the Filter contains rules such as “Do it all,” “Look good,” and “Be nice,” but nowhere on the list is the rule, “Be smart.” Accordingly, the authors call on women to turn their belief system around, not only by starting to think and work smarter, but also to reframe their assumptions and shed their guilt. After time spent on the exhausting Green Line path, many women begin to seriously consider the prospect of opting out of their career. This might be to spend more time with their children, or because of a job loss, burnout or a health issue. In doing so they head off onto what the authors term the “Red Line” path. Now they make their career secondary in importance or even walk away from it completely, to focus fully on life and/or family. In this book the authors describe a new career track opportunity: The Orange Line. Women on The Orange Line do not need to choose between work and life; they choose both and live both fully. Women can use The Orange Line as a launching pad to create a robust, whole life that integrates work, family, and self. Orange Liners learn to consciously pace themselves and design a career path that accommodates their own needs. They also take care not to “do it all,” but rather to assure themselves sufficient support in their home lives to preserve and enable their creative energy. The Orange Line is the most radical call to arms for women in decades. It does not look to governments, corporations and other organizations to change. Instead, the authors inspire women to look inward. That is where women will find – and claim – their power.